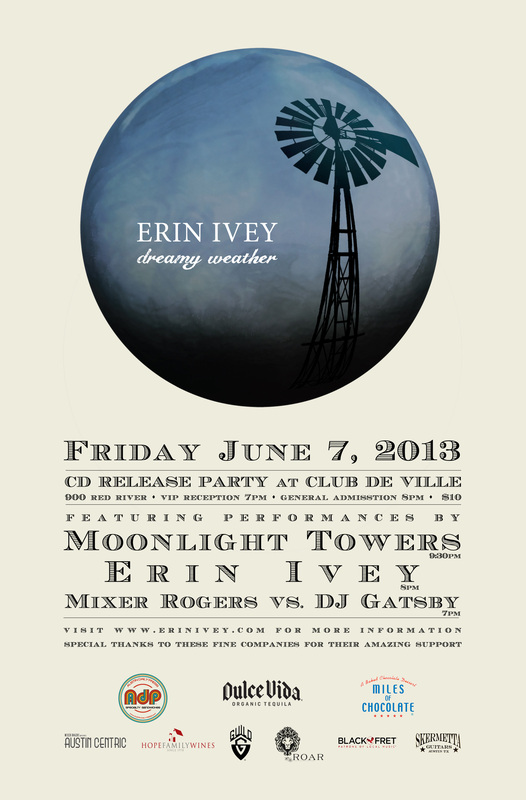 This is the CD Release Party for Erin’s latest record. It’s called Dreamy Weather and I assure you, it is nothing short of dreamy. It’s a special night. Moonlight Towers headline and Mixer Rogers takes on DJ Gatsby who is fresh off the boat from NYC. Special VIP hour from 7-8pm. DJ’s at 7pm. Erin Ivey at 8:30pm. Towers at 9:30pm. $10 cover well worth it. This entry was posted in Shows and tagged ATX, Austin, CD Release party, club deville, DJ, dreamy, Erin, erin ivey, Gatsby, Ivey, Mixer, Mixer Rogers, Moonlight Towers, Party, Rogers, Texas, weather. Bookmark the permalink.